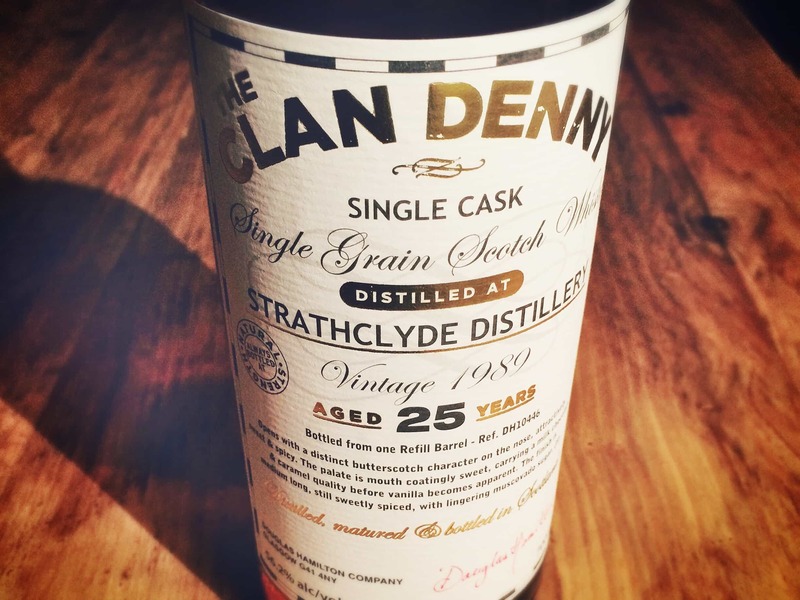 Time for a quick grain whisky review – a bottle of Strathclyde from the wonderful Clan Denny range. Strathclyde distillery is located in the Gorbals area of Glasgow. It is, quite simply, an ugly place. It looks like a Soviet-era architect vomited all over an oil refinery, but that’s kind of what you want in a grain distillery. You can keep your Oregon pine mashtuns and elegant, hand-beaten copper stills. You can keep your organic, washed-in-holy-water malted barley that’s farmed from the fields of Castle MacLocal. In grain distilleries you have enormous great continuous column stills churning out spirit in the name of blended whisky and industrial progress and probably profit too. But sometimes – just sometimes – something beautiful happens within them. A cask of grain whisky is spawned, that stands the test of time, makes its way into the hands of some charitable, philanthropic independent bottler who wants to rescue this cask, empty its contents into artistically labelled bottles and present it to whisky lovers as something worth noticing. That’s basically the premise of the grain whiskies of the Clan Denny range from Douglas Laing. 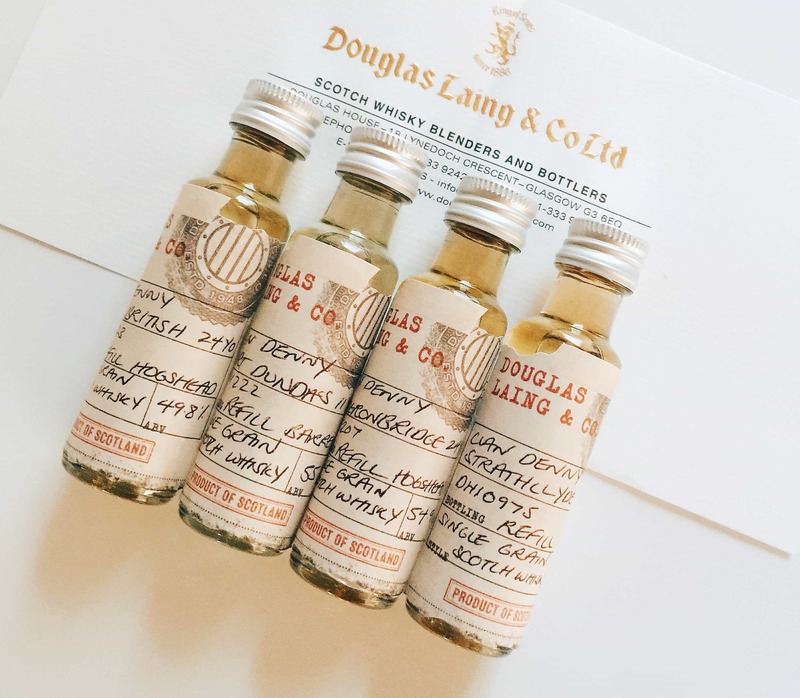 This range is one of my dependable whisky selections. I can always go to it and be guaranteed something of decent quality. And that’s how I ended up with a bottle of the Strathclyde 25 Year Old, which is bottled at 56.2% ABV and comes in at just under £90. Colour: a very bold, deep copper. On the nose: molasses, candied fruits. Sugared almonds. A lively assault on the senses, but once it settles down there are some lovely vanilla sponge notes. Clotted cream fudge, golden syrup. Heady stuff. In the mouth: huge and powerful sweetness. Intense vanilla. Bright wood spices. Chilli chocolate. The woodiness lingers long into the sticky-toffee finish. Victoria sponge, custard creams. Really thick and a little dry in the mouth. Slight menthol note. Got to be honest, it’s not amazingly complex, but what bold flavours! Really lovely dense, syrup quality to it. I can imagine some delicious cocktails being made off the back of this. Also, like all good, old grain whiskies, this goes excellently after spicy foods. The flavours are strong enough to stand out over the heat of, say, a curry, or even a peppery steak. I mean, you could opt for a peated whisky, but there’s almost a dessert quality when you finish food with grain whisky. So I’ve been drinking this one quite a bit after dinner and it works a treat. Room for the Strathclyde 25 Year Old in every whisky-drinker’s cabinet, certainly. I can’t wholeheartedly recommend it, due to the price (it feels it should be about £20 or so cheaper), but I still really like it. We’ve arrived at the second mystery sample from Malt Review and its a corker. These exchanges open new doors, experiences and this dram heralds why an unknown identity initially cuts through..